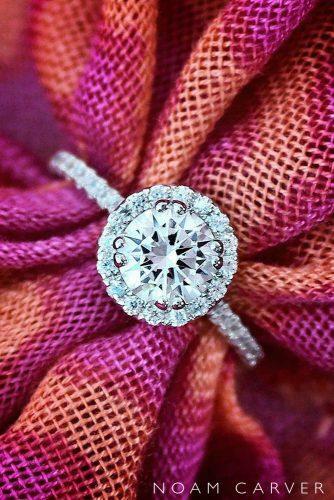 Want a piece of pure jewelry magic for your special occasion? 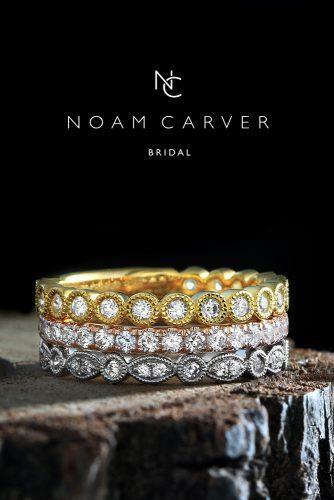 Noam Carver engagement rings are exactly what you are looking for! Noam Carver is a Canadian award-winning sculptor, designer, and goldsmith whose jewelry unites classical and contemporary motifs from around the world. Intuition, exploration and distinction are the three founding principles that guide Noam Carver’s award-winning design process. 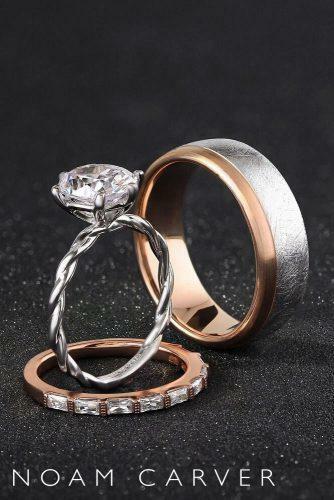 Noam Carver engagement rings are carefully designed with the utmost precision and quality. The brand’s impeccable attention to detail has won hearts of hundreds of fans all around the world, as well as numerous awards. The Noam Carver collection includes a mixture of classic and contemporary styles as well as trend setting designs that have attracted a huge following. Noam Carver strives to highlight the uniqueness of each individual by creating award-winning and captivating jewelry. The sparkling lavish ring setting pictured left is adorned with breathtaking modern elements in platinum. 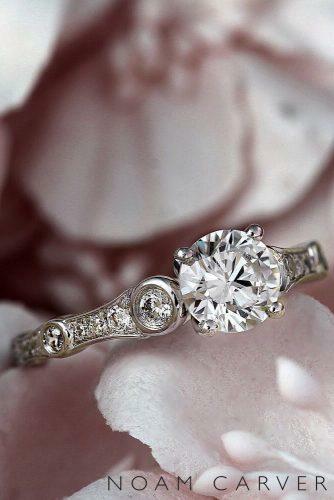 A delightful platinum engagement ring looks so amazing with amazing diamond halo and paved band. 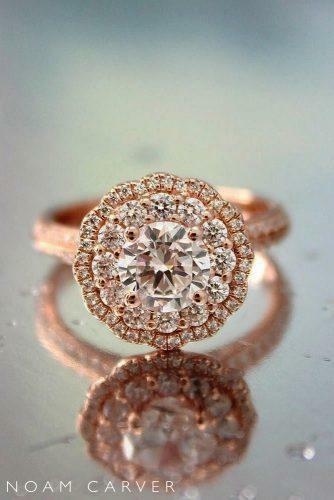 But, if you’re looking for something with a little more subtlety, then perhaps this delicate halo is the ring for you. An ornate band of shimmering diamonds and milgrain edges enclose the center diamond in this breathtaking bridal set featured on the left. 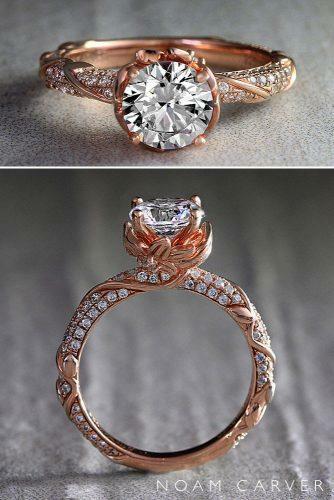 On the middle photo is a beautiful platinum set with rose gold and stylish band. 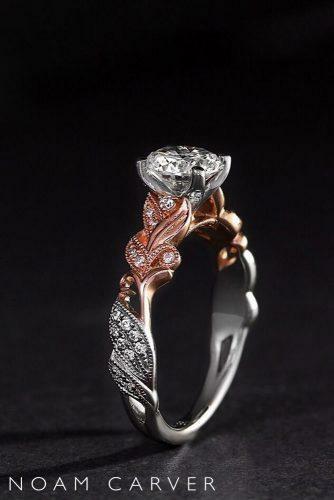 Lastly, this chic set features stunning diamond band and amazing wedding two-tone ring. The intricate halo of pave-set diamonds (pictured left) embraces and accentuates the center diamond of this breathtaking ring. 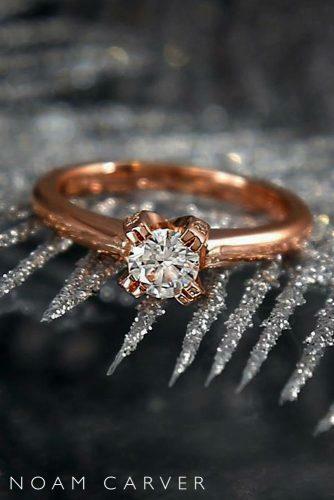 The rose gold adds a feminine touch to this floral inspired double halo engagement ring. The stylish ring pictured on the far right is a custom contemporary design. 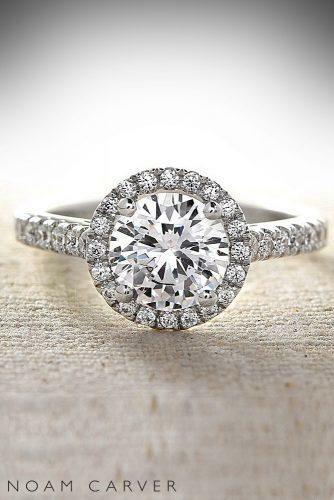 This ring features stunning diamond halo that highlight the beauty of the engagement ring. 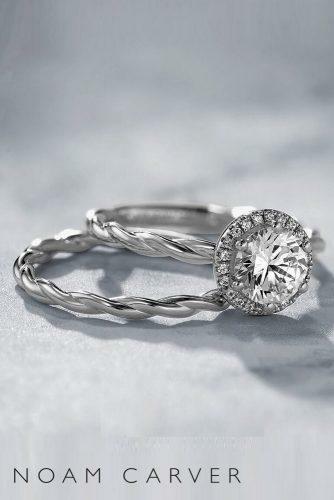 The beautiful round cut stone stone offers a stunning look on a white gold ring. 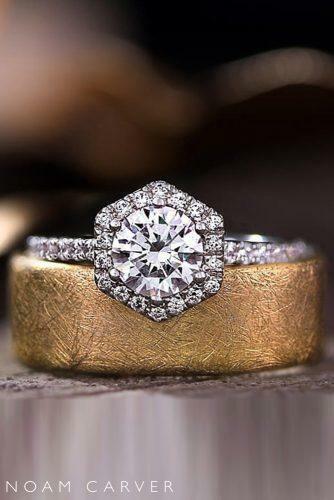 The fancy design on the band is a perfect match for the brilliant center diamond. 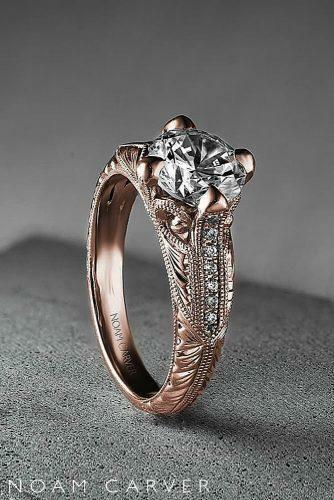 Likewise, this striking floral ring was voted best in rose gold! 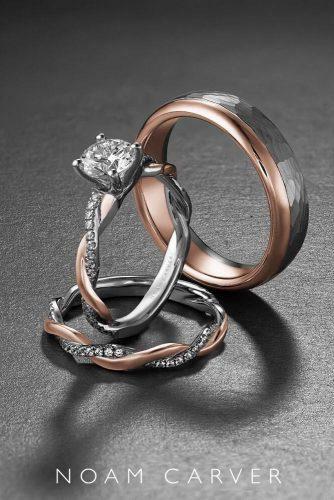 Not to be outdone, the timeless elegance of the ring on the far right features a classic round cut diamond in rose gold. 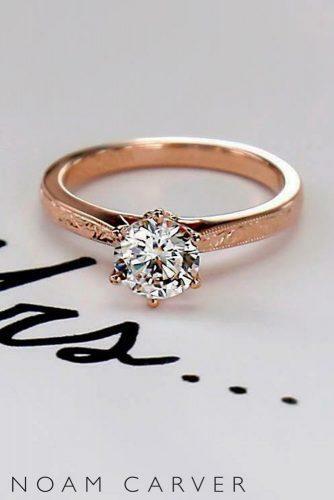 This delightful engagement ring features a classic rose gold band that makes the center gem shine even brighter. 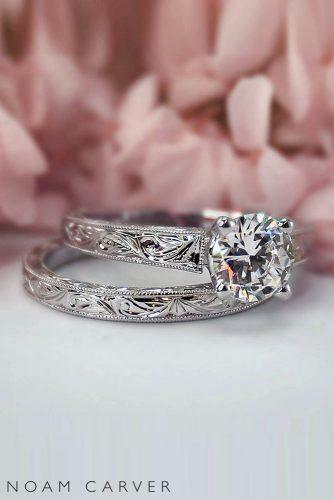 The engagement ring with a round cut diamond is set in a designer floral elements, which is mounted on a stunning band to highlight the center diamond. 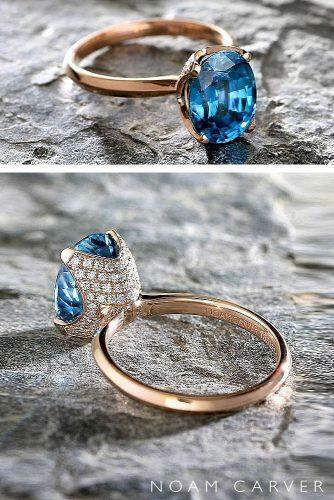 The ring on the right is a rose gold knife edge set with blue zircon in this beautiful design by Noam Carver. 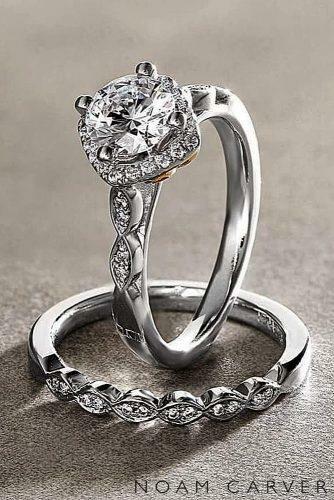 The intricate design on the band of this solitaire ring will make her heart skip a beat! 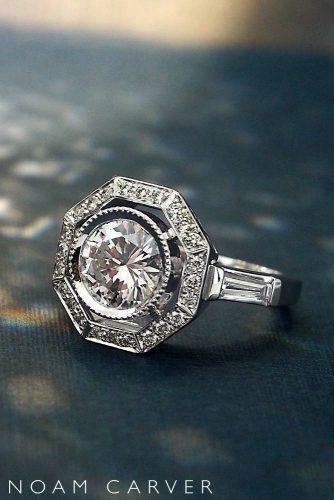 Or, this feminine vintage-inspired ring which features a round cut center gem to complete that ethereal elvish look. 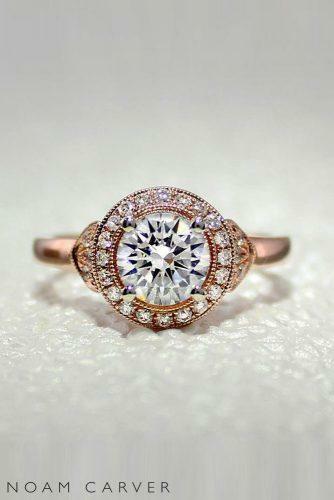 Radiant in simplicity, this rose gold design adds style and romance to this marvelous vintage-inspired halo ring.